It’s beginning to look a lot like spring over in the shop, hooray release day is here! 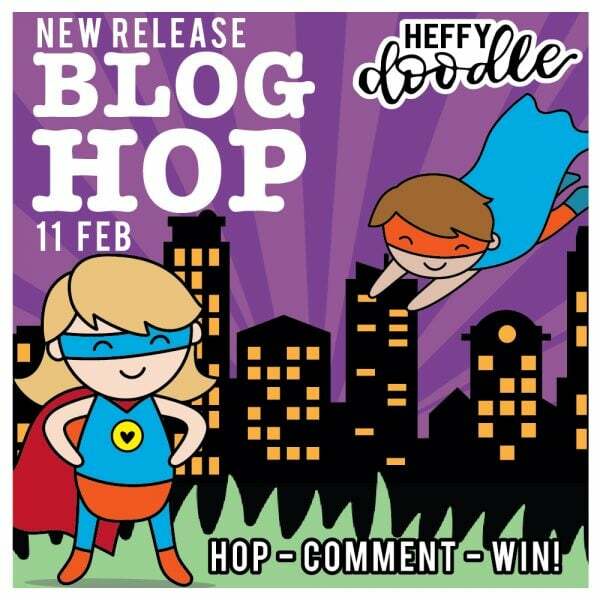 In celebration, we’ve got tons of inspiration from our design team and a chance for you to WIN a £50 voucher to the Heffy Doodle store. We hope you’ll hop along! All the details are further down this post, so keep reading! 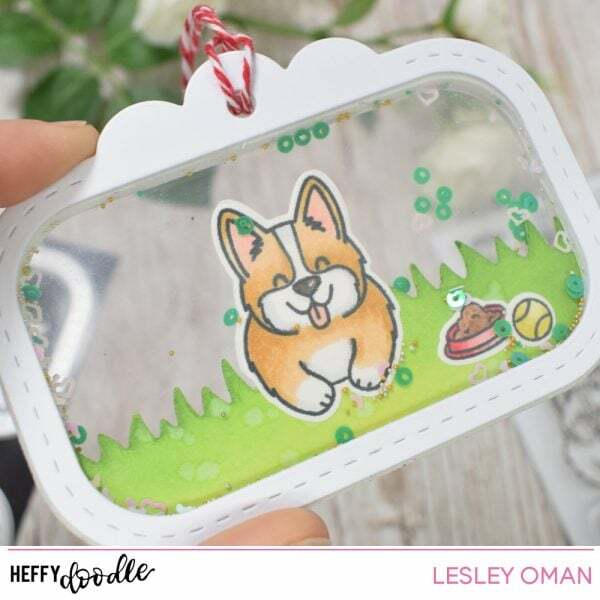 First I wanted to show you an adorable shaker tag by Lesley herself, featuring the Oh Crumbs stamps and dies and our Tag Along die set. Look at this cute face! 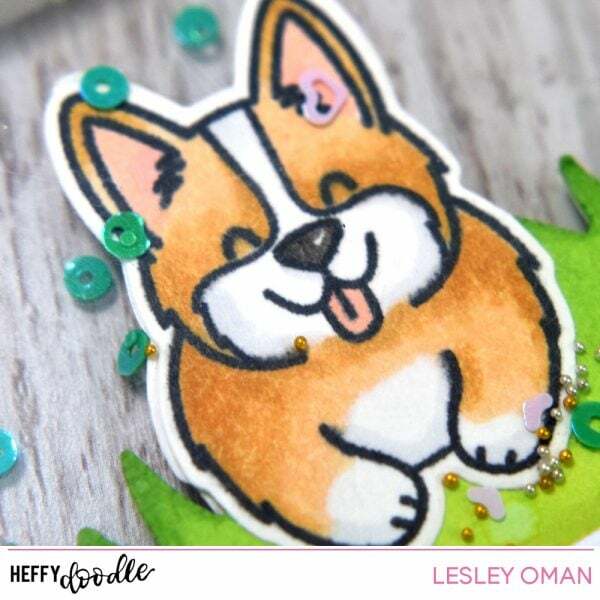 Lesley started by stamping the back to front corgi images from Oh Crumbs and colored in using alcohol markers. Next, she ran them through her die cutting machine with the coordinating dies. Lesley was pretty clever when she designed these dies, because she realised that the dies for the front of the dog and the back of the dog were very similar, so she added little notches to the dies to help you figure out which die is for each image. The notch at the top of the head is for the corgi’s face, and the die with the notch at the bottom, is for the stamp of the doggy’s bottom! HA! Our Grassy Lass Border dies are perfect to set the scene and super easy to blend with distress oxide inks. To create the tag, Lesley die cut 2 frames with white cardstock and two bases with acetate. Next, she added grass, the main images and adhered together with shaker sequins. She actually made this during her LIVE crafty stream last Friday – if you want to take a look you can watch the full video over on here – Come Craft With Me series on Youtube. Don’t miss out! Today’s the last day to receive our free exclusive Rescue Dogs stamp set with any pre-order purchase. Now for the fun part! A chance to WIN! Such fun! I love it! That’s super fun and creative! That little pooch is super cute!! OMG that is the cutest tag ever. This tag is so amazing, fun and so darn cute. How adorable! I love the idea of the completely clear tag! Love the idea of front and back side of tge tag! Adorable tag. There are so many cute dies in this release it will be hard to choose. Awww!!! This is totally cute and funny!!! Love that little guy, so adorable. Love how you can see through the tag. What a fun and happy shaker tag ! Cute tag. Like the way you can build a scene inside that you can see from both sides. Enjoy watching your live CCWM. to get the details on claiming your prize. Those corgi’s are just WAAYYY too cute!! And I love this clear shaker tag!!! Are the robot dogs ever going to be available on your site to go with the other robots for those of us who weren’t at Creativation?!! Cute tag and dog even if I am a cat person. Such pretty and fun project! Adorable tag. Cute release and I enjoyed the blog hop.